Who out there loves pumpkin pie? I don't love it, but I don't hate it. But what I do love is the smell of pumpkin pie spices. Trevor and I found a way to have the smell of pumpkin pie spice in the house with nary a pie in sight. 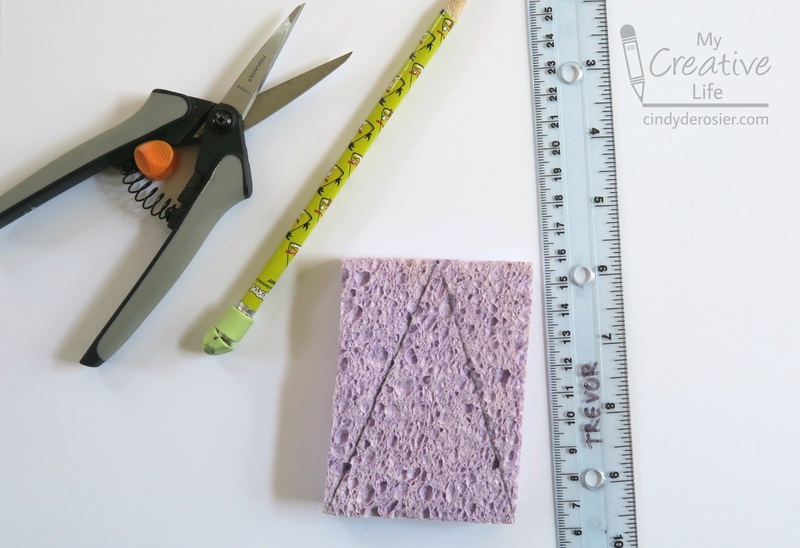 Use the pencil to mark the center of the short side of the sponge. Draw straight lines from that center mark to each of the opposite corners to form a pie-shaped wedge. Cut out the wedge. Use your Frisbee to mix orange paint with cinnamon. 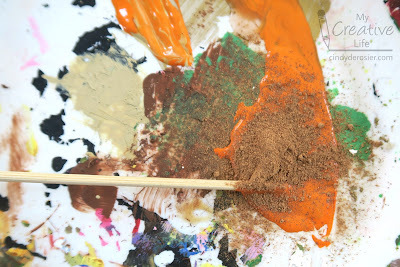 The spice will darken the paint slightly and give it a delicious smell. How much should you add? That will depend on your paint. We did about 50/50 paint and cinnamon. 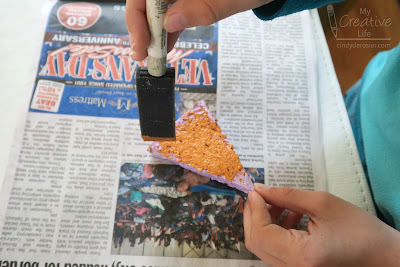 Use the foam brush and a pouncing motion to push the paint into the top and sides of the sponge. Ideally, your sponge is orange and not purple like the one Trevor had to use. If your sponge is not orange, be sure to pounce the paint into all the crevices. Let the paint dry. 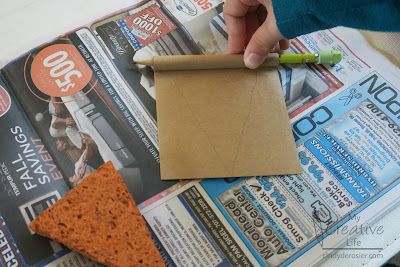 Trace the painted sponge onto a rectangle of kraft cardstock. Roll the far side around a pencil until it reaches the edge of where you traced the sponge. Remove the pencil, then cut out the pie crust. You'll make a straight cut from the point all the way through the rolled-up crust on both sides. Then gently unroll the cardstock, add glue, and roll it back up. 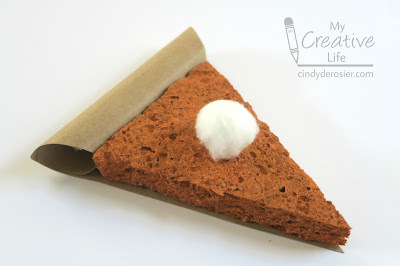 Add a generous amount of glue to the bottom of the sponge and glue it to the crust. It should fit perfectly! Dip a cotton ball in cinnamon oil and glue it to the pie. Trust me when I say this smells amazing. 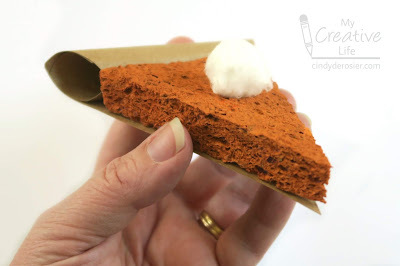 You can use it as a centerpiece or table decoration, or thread fishing line through the crust and hang it wherever you'd like the scent of pumpkin pie! This is marvelous! I'm going to have to make one of those. Oh, and off subject but... Do you have a recommendation for a ink stamp pad that works well on photos? I looked in your Gift Guide and didn't see one ... TIA! I'll do some experimenting and get back to you! I was assuming Staz-On would work well, and it totally does! I'll add it to the Gift Guide. I was leaning towards that one myself. 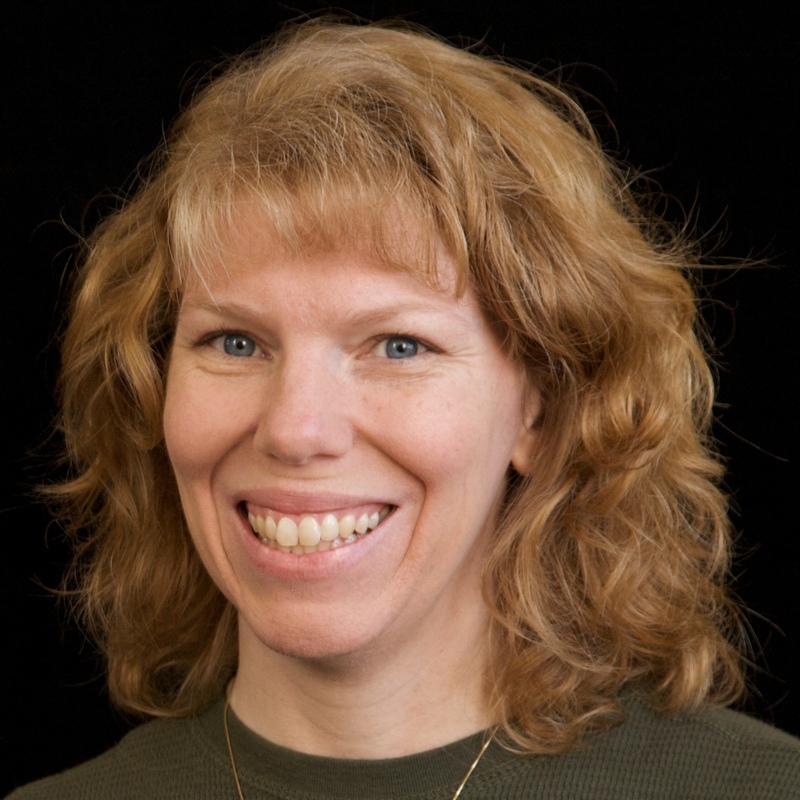 Thanks for your input! How fun! 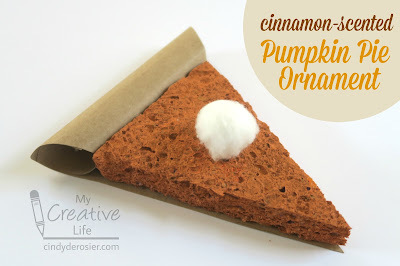 Perfect for anyone who loves the smell of pumpkin pie!